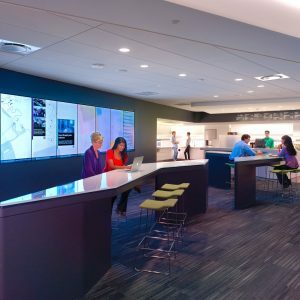 With visually inspiring and accessible interactive digital displays, we created a persistent and unified experience of Steelcase's presence across many diverse worldwide locations. The adaptive, flexible nature of these large-scale displays allowed for widespread implementation. Physical presence as a cultural unifier. We brought together nine locations in five countries and across three continents by blending space design with technology to simultaneously display what was happening all over the world of Steelcase. This interactive, visual design drove a sense of belonging and local accessibility for a global community. Opportunity for serendipitous discovery. The living display of visually compelling data, colliding ideas, and insights from across the organization fostered outside-the-conference-room conversation and problem solving. Technology adaptability and global integration. Integrated technology supporting product updates and imagery, company events, real-time news, thought leadership, and social feeds, in a singular, unified communication feed across the planet.